"This is it," I said to myself, looking out at the Pacific Ocean. "The farthest place south in the United States." Thirteen years later, the Husband said something similar as we gazed out at the horizon. 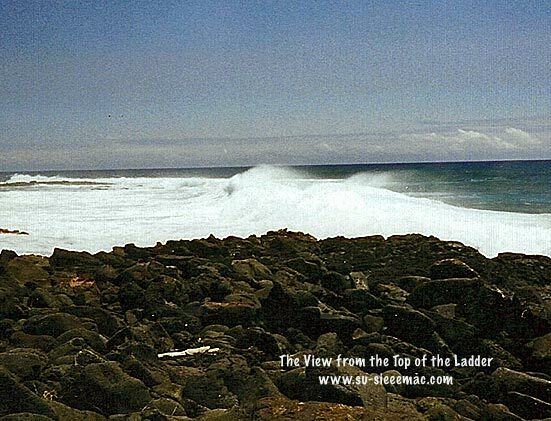 We were standing at Ka Lae on the Big Island of Hawaii. It's also known as South Point or The Point. I've had the good fortune to visit Ka Lae twice. 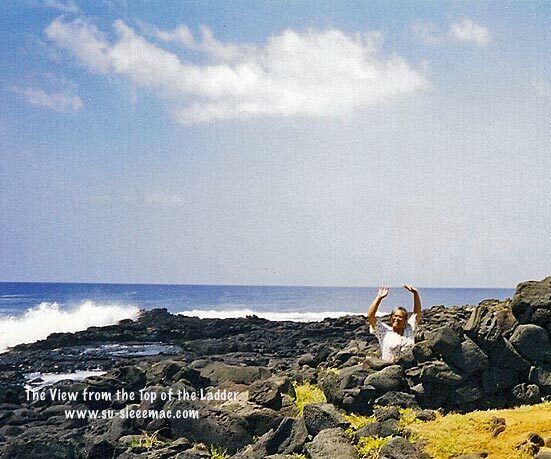 The first time was on my solo trip in 1984 and again in 1997 with the Husband, which was his first trip to Hawaii. These photos are from our trip. The water at the most southern point of the U.S. was very inviting. 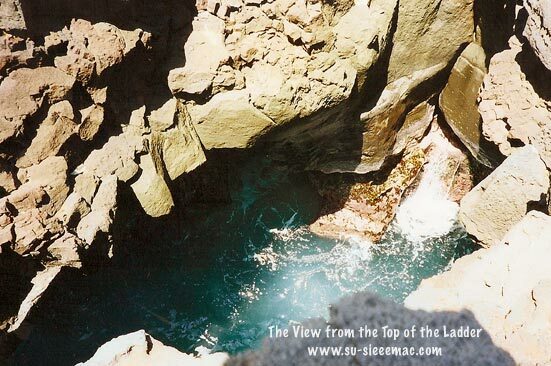 Even looking at the photo, I imagine myself jumping in. Imagining is best. The currents are very strong at Ka Lae, so swimming is not recommended. The Husband and I are good swimmers, but we knew it was best to heed the warnings. The windmills weren't there in 1984. So I was very surprised to see them. 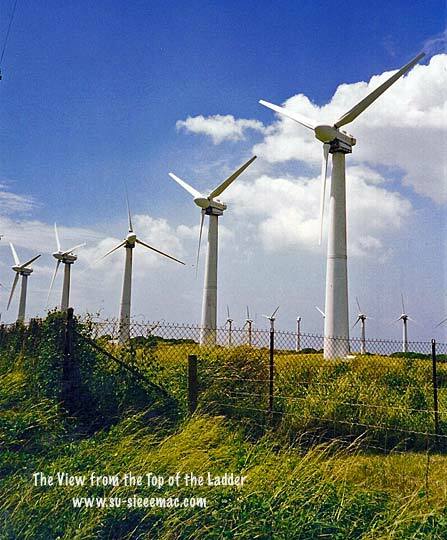 Ka Lae is a perfect place for a wind farm, with the steady, strong trade winds. From what I've read online, the ones we saw on our trip have long since been replaced by newer windmills, which are owned by the Pakini Nui Wind Farm. According to the wind farm's website, the windmills produce power for about 18,000 homes. Many historians believe that the Polynesians first landed here when they first came to the islands. That was sometime between 400 and 800 A.D. Ka Lae is considered a sacred place. I think it is. Soon after we returned home, the Husband bought a computer (love at first sight), and several months later, he said See ya! to his 9-to-5 job. A great decision by the Husband. Also, to go to Ka Lae with him, as well as by myself. It's Alphabe Thursday with the lovely Jenny Matlock. Today's letter is K. Click here to read posts by other participants. Your friend is also very blessed! I hope you have have a chance to visit Hawaii again. Thanks, Laurie. I'm glad you've enjoyed them. We were in Hawaii in 1997 too for our 20th wedding anniversary, a great time. I love the top photo. It would have been tempting to swim there! Thanks for linking to the letter K.